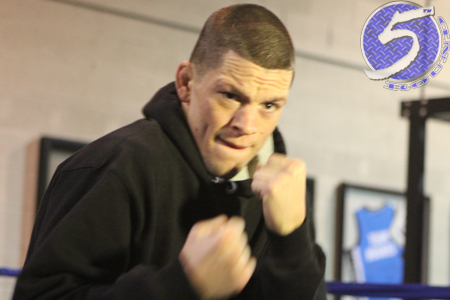 UFC lightweight Nate Diaz (Pictured) only granted two one-on-one interviews during Tuesday’s media workouts. The good news, 5thRound.com was able to snag one of them because we were in line right after Ariel Helwani. The bad news, it only lasted a couple of questions because a certain someone was also in the gym at the same time – much to Diaz’s dismay. UFC 141‘s four featured athletes were asked to attend the press junket. Alistair Overeem and Brock Lesnar meet in Friday night’s main event, but bookended yesterday’s festivities and were never in the building together. As for Diaz, only minutes into his interview session, opponent and bitter rival Donald Cerrone began his workout just several feet away. Cerrone’s presence, as well as the thunderous noise coming from his pad work, clearly set Mr. 209 off. Unfortunately for us, Diaz abruptly (yet politely) ended our chat. We later brought the incident up with Cerrone, who stated he intentionally added a little extra oomph behind his strikes to ensure Diaz heard the punishment that could be coming his way. Please click HERE to watch that video footage. The 155-pounders will have the opportunity to settle their differences this weekend inside the MGM Grand Garden Arena in Las Vegas, Nevada.